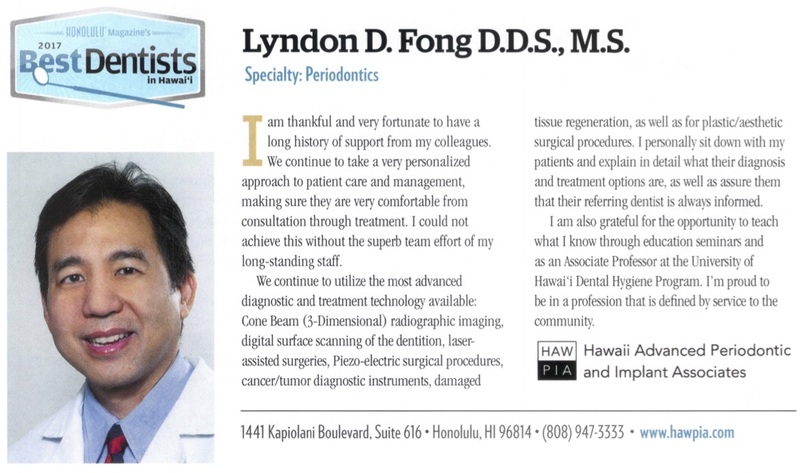 Dr. Lyndon Fong was born and raised in Honolulu, Hawaii, and attended Iolani High School. He then went on to the University of Washington in Seattle and Northwestern University Dental School in Chicago. He received the Hodson Oral Surgery Award there, given to one student each year. 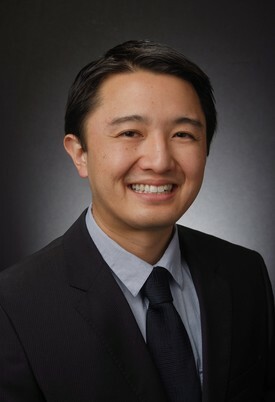 He returned to Honolulu to practice general dentistry for three years, and returned to Northwestern University to pursue a residency in Periodontics. He also obtained a Masters of Science degree, focusing in Immunology. In 1994, Dr. Fong opened his private practice in the Ala Moana Professional Building, and has recently renovated it into a high tech treatment center. 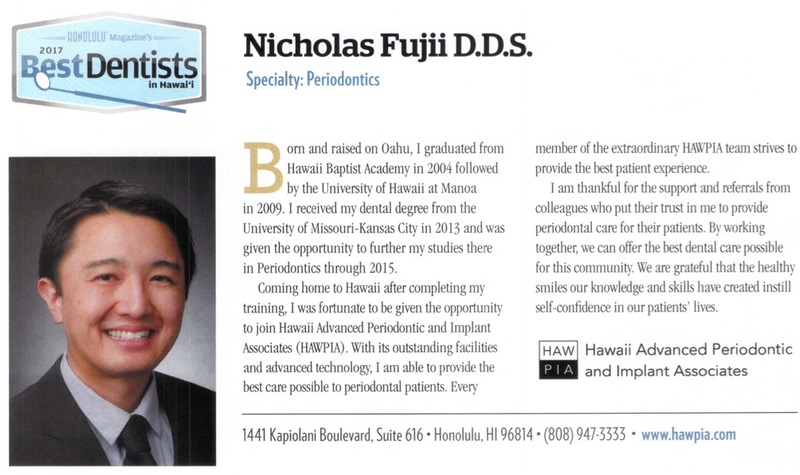 With new associates joining the practice in the last two years, we have renamed our team "Hawaii Advanced Periodontic and Implant Associates". 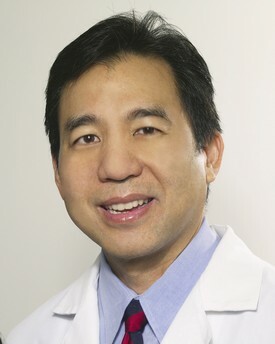 Outside of his professional practice, Dr. Fong enjoys everything that nature, and especially Hawaii has to offer. Surfing, Standup paddle boarding, hiking, fishing, and camping are passions of his, especially when enjoyed with family. Indoors, the “nerdy” side of Dr. Fong finds him tinkering with computers, Radio Control Helicopters, and being a self confessed tech gadget enthusiast. These hobbies has allowed him to customize or invent many of the surgical instruments and techniques he utilizes everyday in his practice. Dr. Hodson Award for outstanding student, Oral Maxillofacial Surgery Dept. Fujii NJ, Gibson TM, Satheesh KM, Cobb CM. Thyroglossal Duct Cyst: Abbreviated Review and Case Report. Compend Contin Educ Dent. 2017; 38(2): 97-101.